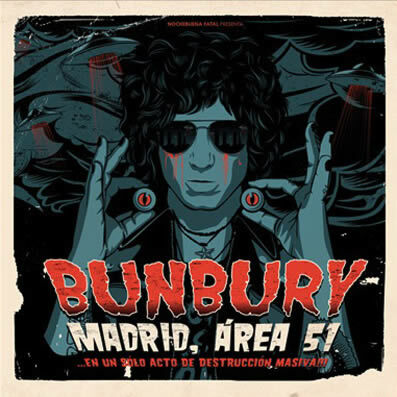 I do not know if “Madrid, Area 51” is a dual dvd + cd or vice versa, because both the two audio discs as the film is a new highlight in the career of Bunbury. Speaking of touring, the “Palosanto tour” contained in them has been the most ambitious in his career (including Heroes del Silencio), but also the most avant-garde. On the other hand, if we think of his pitches live, “Madrid, Area 51” is his great work with “Gran Rex”, both being two sides of the same coin: an advanced, another classic, but two facets of his author after all. However, precisely for that component of daring, “Madrid, Area 51” is the most exciting of his live shows. All part of “Palosanto” which was the album to present and showed us to a renovated Bunbury found warmth in aseptic resulting in a very modern and exciting version of himself. This led to the concept of a futuristic visual tour but also reformulating their old songs, something common in his career, but in this case taking them much further. This has been faithfully reflected in the film by director Ivan Garriga, who has managed brilliantly balanced between statism of classic film and the nerve of today, with a quality that is comparable to a Blu-ray of Depeche Mode, Stones or U2. None spanish artist has never recorded an audiovisual work at this level. Director, cinematographer, audiovisual executive producer & colorist of Enrique Bunbury’s DVD / Blu-ray Madrid, Area 51. ← Award Bronze Best Pack Branded Content with Ferrero Rocher.